Stainless steel trays for heating well and easy cleaning. Control panel can be detached by loosen a locking buckle. Automatic shutoff timer can be adjusted from 1 hour to 15 hours. 6 Temperature levels thermostat can be adjusted from 95 F to 158 F.
Stainless steel construction is with good heat conducts and a long service lifespan, it is also easy to clean. 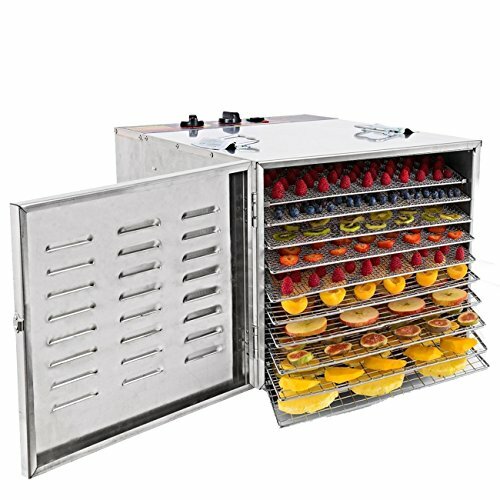 It has 10 trays, 15 sq ft of drying space in small volume, you can create different types of dehydrated foods in one convenient batch. Great food dehydrator for trail mix, dried fruits and vegetables, beef jerky, custom potpourri, dried herbs and spices and more! Comes with shutoff timer and adjustable thermostat from 95-to-158 degrees Fahrenheit.You can set the optimal processing time and temperature to reserve the best flavor of drying food. Easy to assemble and use, especially for large families, gardeners, sportsmen, outdoor hobbyists, health-conscious enthusiast.